It used to be when you needed to regain your sanity you could just slip to your backyard and listen to the wind make music with your favorite wind chime. Now unfortuantely for many that’s not the only sound they’ll hear if they sit outside. They’re also stuck hearing sirens, traffic and on occasion someone having a dispute right on the front lawn. 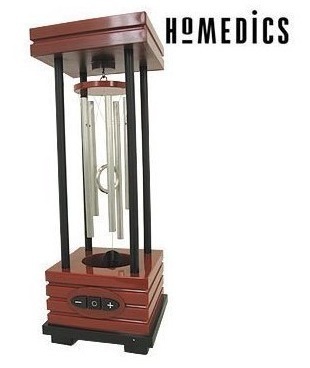 For those that would still like to enjoy listening to a wind chime in peace, there is this indoor chime. Within the base of this little chime is a fan to make the chimes clink together, simulating a little bit of a breeze. It has 5 silver colored aluminum tubes and a circular aluminum wind catcher. There are adjustable controls to give you a bit of control over how much the chimes move. To keep it powered it has an included AC adapter or you can use 4 AA batteries. You can pick it up for $39.99 through Amazon. I need to hear the sound before buying.